Our last blog post considered SEO project management. Setting up and maintaining Adwords, Yahoo or Microsoft ads also requires project management skills and systems. After setup and putting the campaigns live there comes a stage of continuos improvements, combined with new input like new products or services from the clients, actions etc. Swydo is the perfect tool to manage these kind of subscription based PPC services. 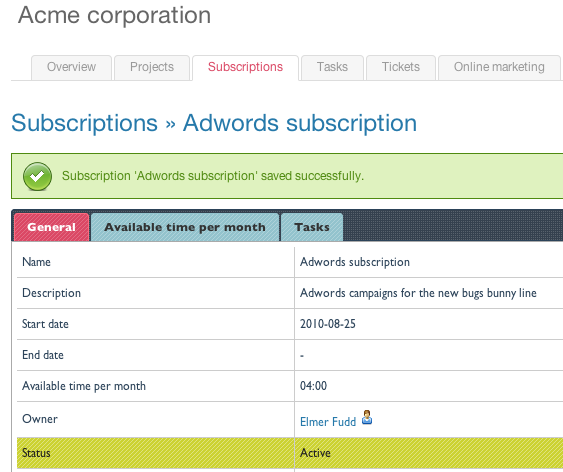 In Swydo you have the option to create a project or a subscription. The definition of a subscription is that is has some different characteristics: It has for instance the variable “available time per month” and you can use the option to define some extra information like Adwords Media Budget and Conversion goals. Once the services start rolling you have a nice overview of your accomplishments, available hours and you can even add reports using Google Docs. Swydo’s USP’s compared to online project management tools, like Basecamp, Huddle etc, focus on 2 main issues: 1. Subscription based services are supported and 2. Integration with Online Marketing. Happy PPC managing with Swydo!